Join us for an event…..
Category : Events Diary, What's New? 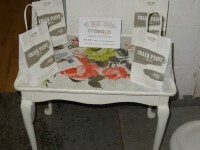 CHALK PAINT MIX is now available at Recycling First warehouse in Macmerry. You can also buy our upcycled furniture with a donation going to the local charity. We are excited about working together to organise an event which will be held at the warehouse during ‘Pass It On’ week in March.